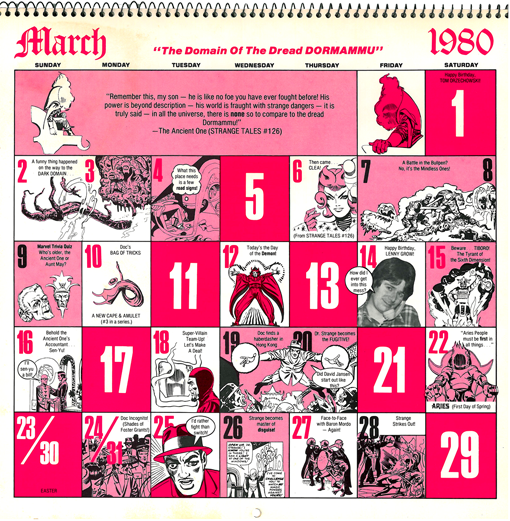 The Marvel Comics Calendar 1980: The Occult World of Doctor Strange has a gorgeous piece of art for March by Pat Broderick and Bob Layton entitled "The Domain of Dread Dormammu" that features Doctor Strange fighting Dormammu while Clea sits in chains as the fiery fiend's prisoner. 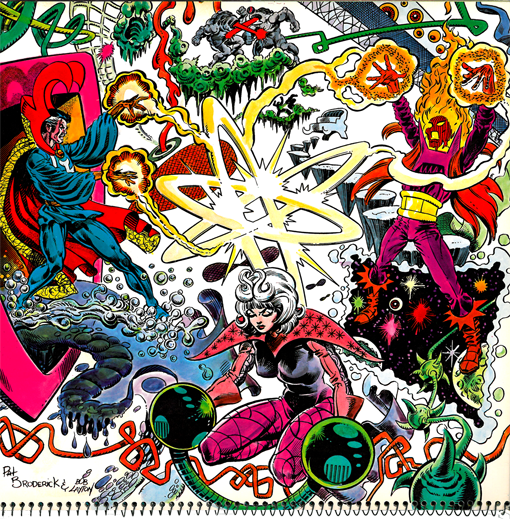 The Ancient One warned Doctor Strange in Strange Tales #126 (November 1964) “Remember this, my son – He is like no foe you have ever fought before! His power is beyond description – his world is fraught with strange dangers – it is truly said – in all the universe, there is none so to compare to the Dread Dormammu!” Click on either of the images below to see them in high-definition!